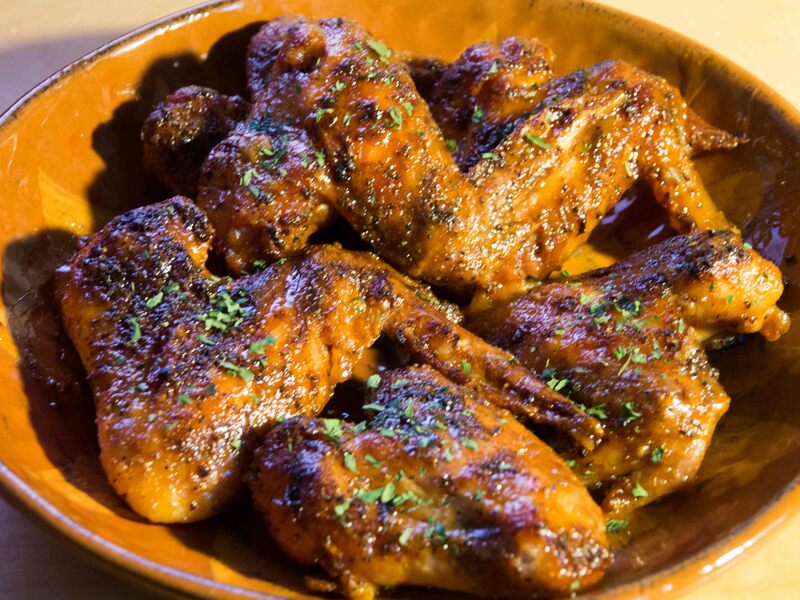 Put wings in a large bowl and drizzle with olive oil. Toss to coat. Dust with the rub and then toss again. Set a cooling rack on a cookie sheet or jellyroll pan. Lay wings out on a rack and let them sit uncovered in the refrigerator for at least 2 hours, and preferably overnight to let the rub do its work and for the skin to dry out a bit. 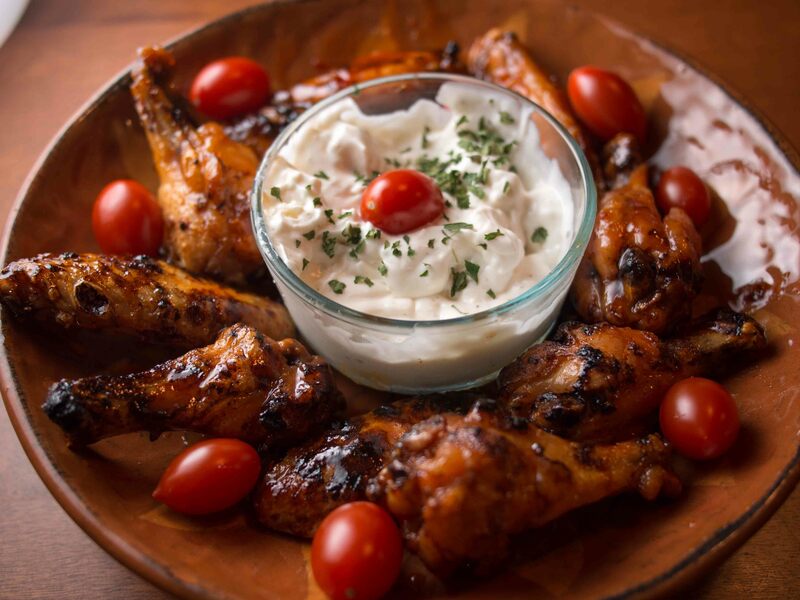 While the wings are cooking, make your sauce by combining the mustard, hot sauce, honey Worcestershire, garlic, and salt in a small saucepan. Stir to combine and bring to simmer. Remove from heat but keep warm. 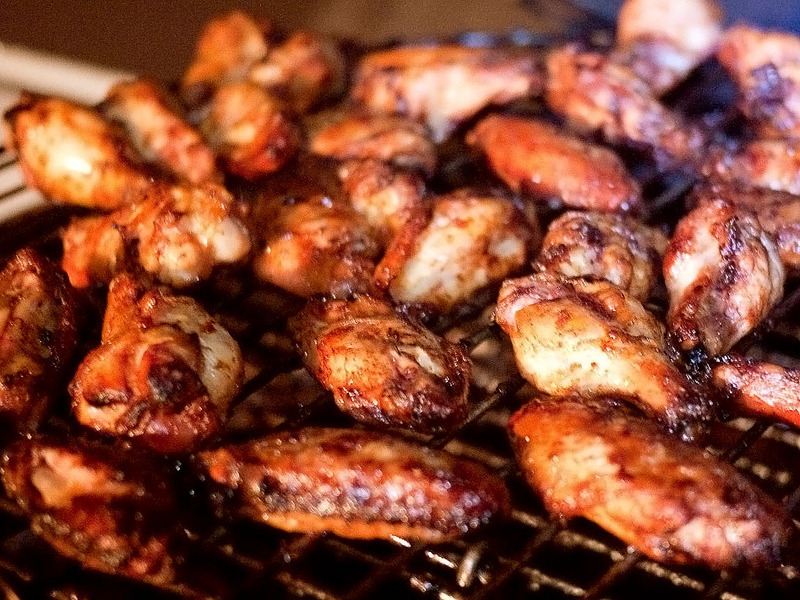 Baste the wings on both sides with the sauce. 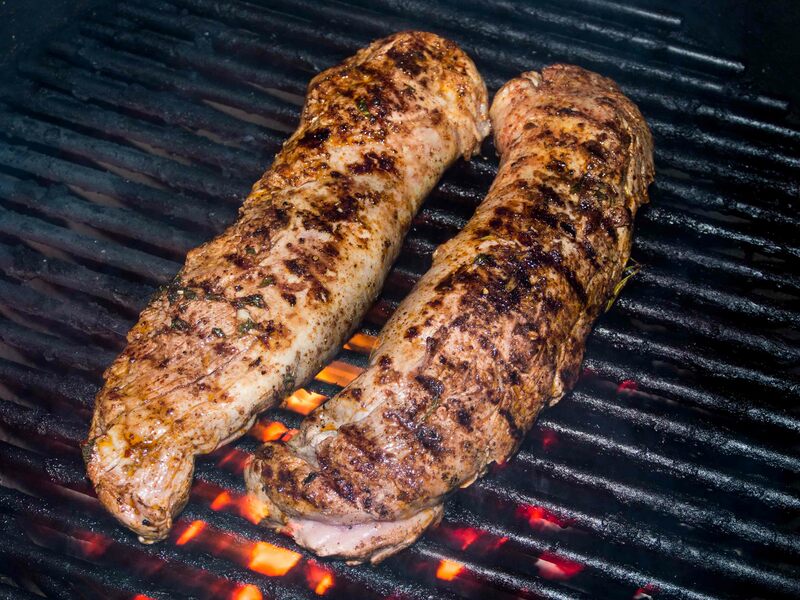 Let them cook for another 10 minutes, then baste again. Serve with bleu cheese dressing and/or any remaining sauce for dipping. Wings came out crispy and sticky. The sauce ended up a little too sweet for my tastes. Need a touch more heat and some acid to balance it out. “Neither snow nor rain nor heat nor gloom of night stays…” sorry, that’s the USPS’s motto, but anyway, I’m not going to let a little cold come between me and some hot wings. Toss wings in oil and then season heavily the Penzey’s seasoning or your favorite rub. Set a cooling rack on a cookie sheet or jellyroll pan. Lay wings out on a rack and let them sit uncovered in the refrigerator for at least 2 hours, and preferably overnight to let the rub do its work and for the skin to dry out a bit. 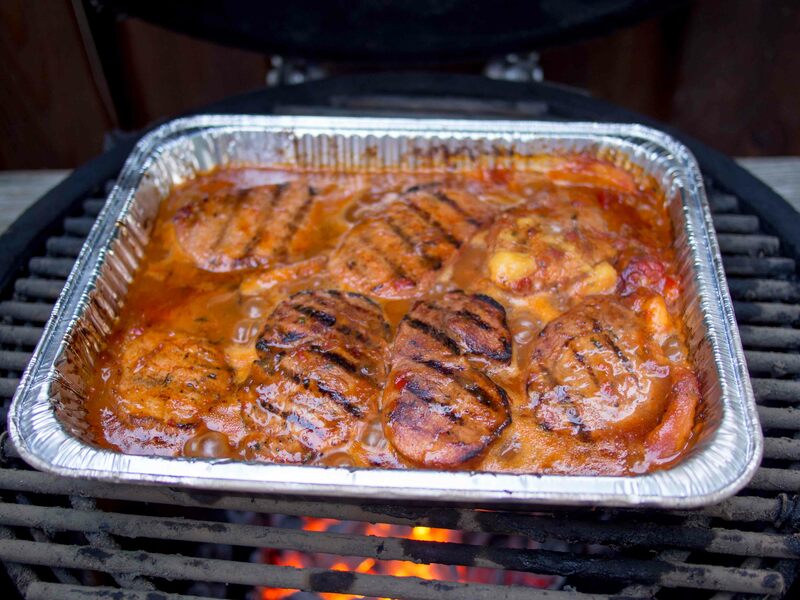 While the grill is eating up, combine the butter, hot sauce, honey, chili sauce, and vinegar in a small saucepan. Bring to a simmer, them remove from heat but keep warm. Serve with bleu cheese dressing for dipping. The sweet/hot/tangy flavor of the wings was perfect. Just when you thought one of the flavors would drown the other out, the others came through to create a great balance. I really like the brightness that the rub added. Despite the cold, the BGE performed like a champ. I noticed no change in cooking times at all. I have been trying my hand at lacto-fermentation – making kimchi, sauerkraut, hot sauce, and veggie pickles the old-fashioned way using little more than salt, time, and gut-friendly lactobacillus. It’s a little putzy and time-consuming, but I’m enjoying the results and am glad to be adding more probiotics to our diet. So I was pleasantly surprised to find Sunny Bang Private Label commercially producing a lacto-fermented hot sauce that is still “alive” when you get it. Of course, I had to give it a try. The bright, orangey-red sauce comes in a very cool swing-top bottle. It has a nice, thick texture and a bright, fresh veggie aroma. There’s not much heat to it, but what there is comes all up front and doesn’t build up over time or linger. It has a bit if zip from the lactic acid and vinegar, but nothing harsh. The finish is all fruity sweetness with a little effervescence. In short – this ain’t no bubba-slurping, taste-hiding, vinegary hot sauce. It’s harmonious (not a word I would ever imagine using to describe a hot sauce) – all the flavors work together to give everything you put it on a bright and tangy bit of heat. I have been very happy with my “hot off the grill” technique for steaks. There’s something very primal and satisfying about cutting into a still sizzling steak. The only thing that could make it better? Butter, of course! In a small saucepan, melt half the butter over medium-low heat. Add anchovies and simmer until they melt into the butter, about 2 minutes. Add the garlic and cook for another 2 minutes. Turn off the heat and add the herbs, Worcestershire, paprika, salt, and pepper. Remove from heat and let cool until mostly solid. Add the remaining butter and whisk to combine. Spoon mixture onto a large ramekin, cover with a sheet of waxed paper, and refrigerate until you are ready to use it. 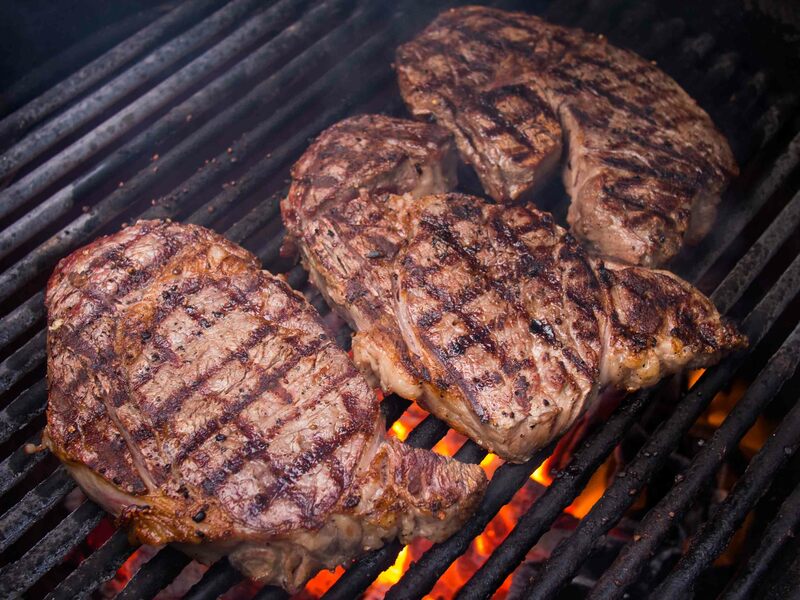 Season the ribeyes with a heavy coating of sea salt (2 to 3 teaspoons per side) and a few grinds of black pepper blend. Stash uncovered in the fridge while you get your grill set up for a direct cook at a sub-nuclear 700°F. Sear steaks for 60 seconds, then rotate the 90 degrees and give them another 30 seconds on that side. Flip and repeat the process on the other side. After both sides have been seared, keeping flipping them every minute or so while checking for doneness. These steaks only took another 2 minutes of flipping to hit a nice medium-rare 125°F internal. 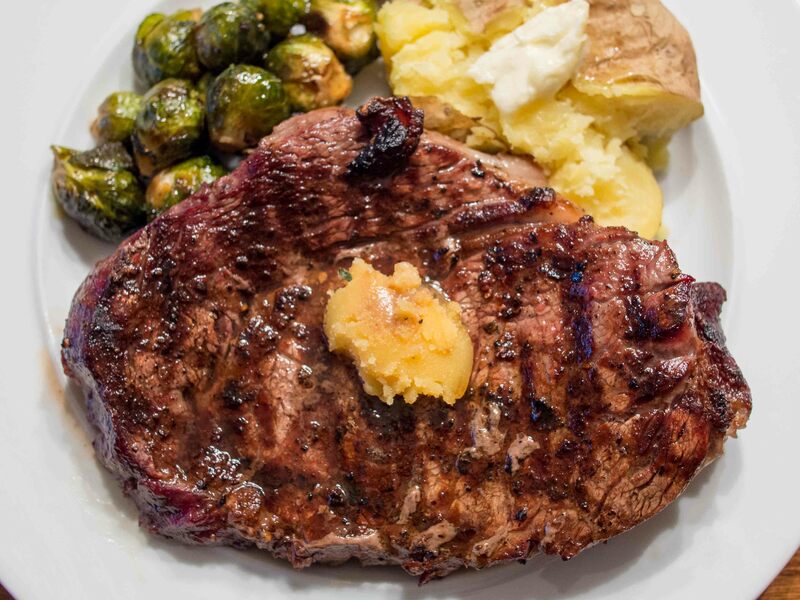 Move the steaks straight off the grill and onto your plates, pausing ever so briefly to spoon a dollop of steak butter onto them. I was expecting the butter to be a umami bomb – rich and savory, but I was pleasantly surprised that the herbs gave it a much brighter taste. Between the anchovy and the herbs it had a fresh, almost briny, flavor to it that really woke up the steak. My dear wife saved me two of her precious peaches for this sauce. In the end, she said it was worth the sacrifice. The recipe uses a wet blending technique that I’ve become very fond of. 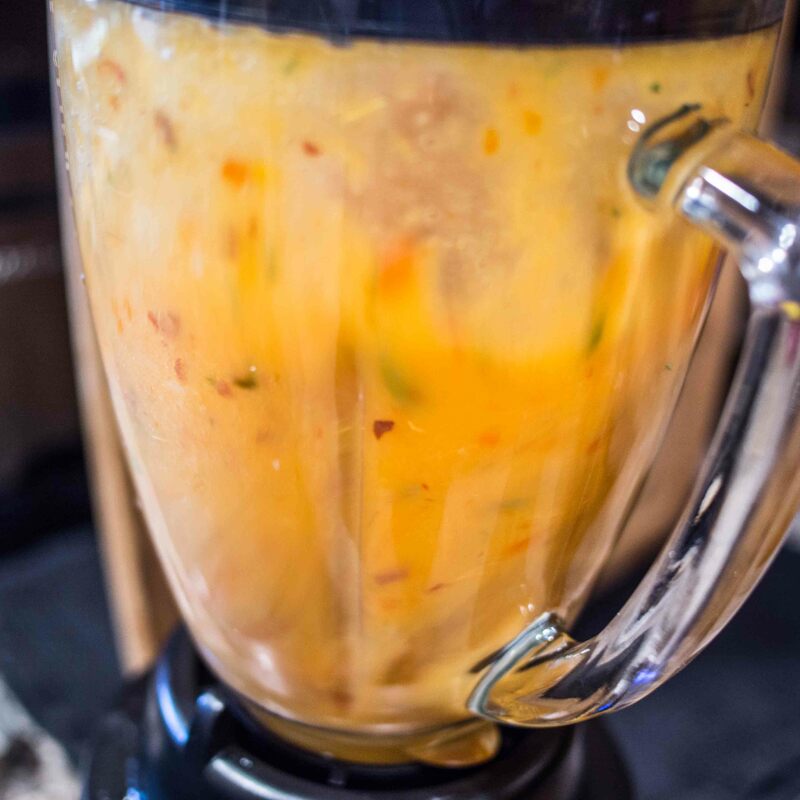 Rather than chopping up all of your ingredients individually, just cut them to a manageable size (quartering is usually enough), add a bit of liquid to float the goodies, and then pulse them in a food processor or blender until you reach the desired consistency. Combine all ingredients into a food processor or blender. Give it all a whirl until well-combined, but not pureed. You want some chunks of this and that floating around. Pour into a large saucepan over medium heat. Bring to a boil, then reduce heat and let simmer until it has reduced to about a pint (about 15 minutes depending on how much water you used). 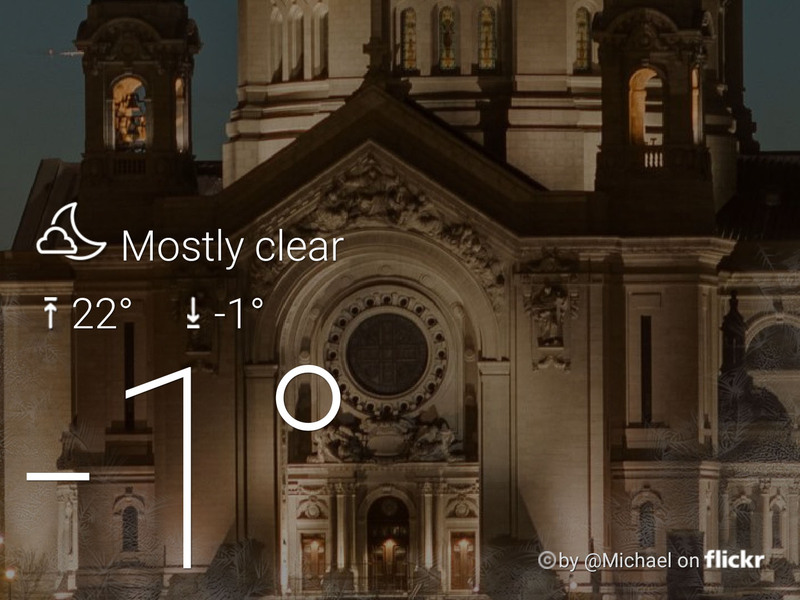 It should be thick enough to coat the back of a spoon. Let cool, bottle, and stash in fridge. 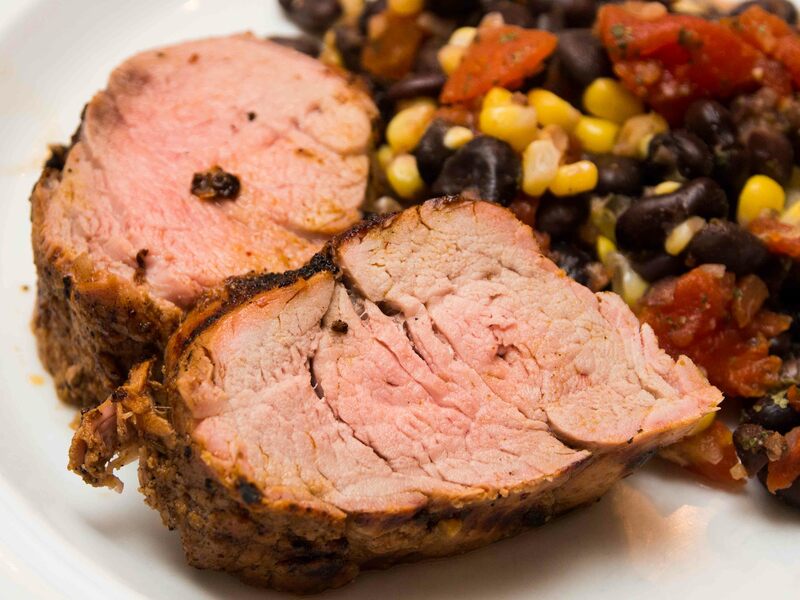 Set your grill up for a raised direct cook over low (250°F) heat. On the Big Green Egg I used a Woo2 ring to get the cooking grate further from the heat. When the grill is up to temp, add some wood for smoke (apple this time). While the grill is heating up, trim the rack down as much as you care to. I like a St.Louis-style rack, so I remove the chine (breast) bone and the connective tissue between the chine and the ribs themselves. I also removed the tough membrane that covered the bone side of the ribs to let more flavor in. 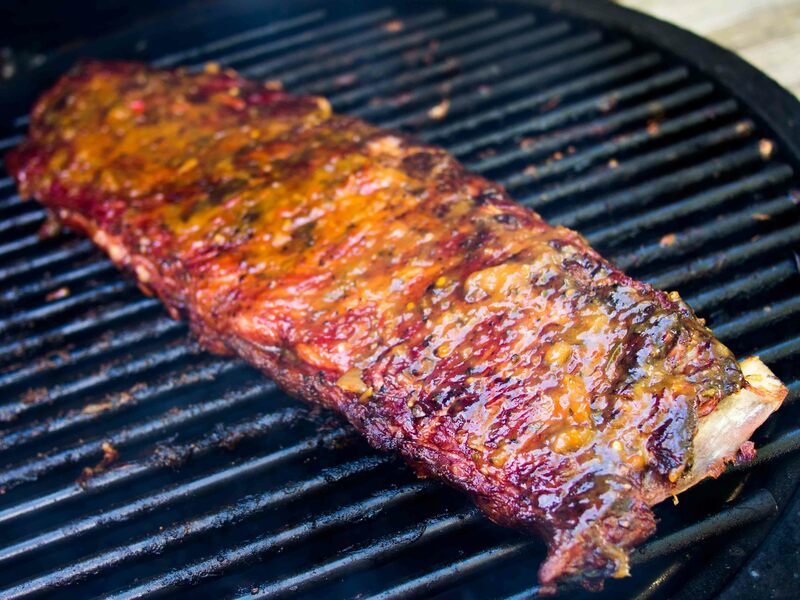 After the ribs are trimmed, season them with a dusting of your favorite rub. I went with just salt and pepper on these to let the sauce shine through. When the wood smoke goes from white (bad) to blue (good), move the ribs to the grill. 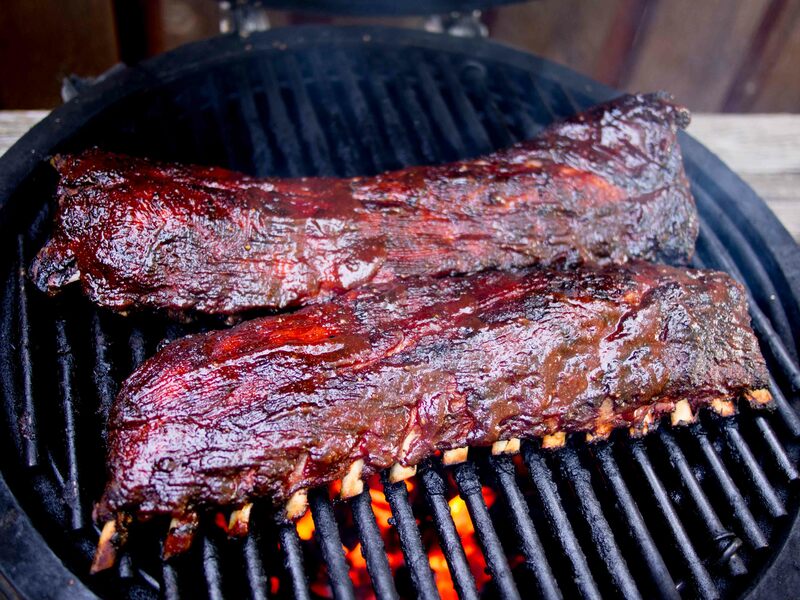 Spare ribs take a good 5 to 6 hours to cook. Start them bone side down and then flip them end-to-end and top-to-bottom ever hour. 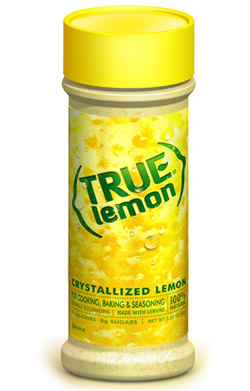 This helps even out the hot spots that can happen when you cook with direct heat. At hour 5 they should start showing signs of doneness – meat pulling back from the bone, and meat cracking when you lift up the rack at the end. When in doubt, check the internal temperature of the meat between the bones – it should read at least 180°F prior to saucing. 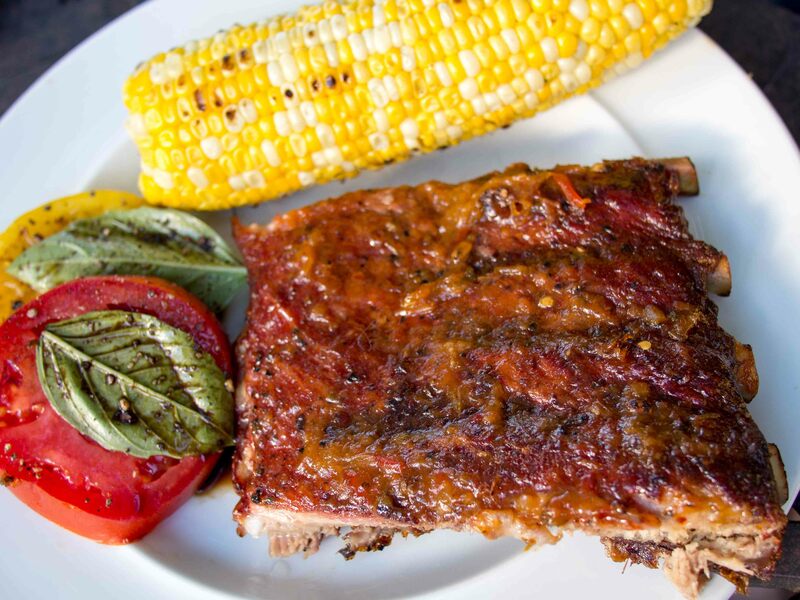 Sauce the ribs with the Peach Barbecue Sauce – and let them cook for 10 minutes. Sauce the meat side and let them go for another 10 minutes. Then sauce the meat side again and move the ribs off to a plate to rest for 10 minutes. Serve with remaining sauce. Wonderful, clean peach taste with just enough sugar and just a tiny hint of rosemary. It’s very versatile and is great both spread on toast and dolloped on pork chops. Must make gallons of this next year. 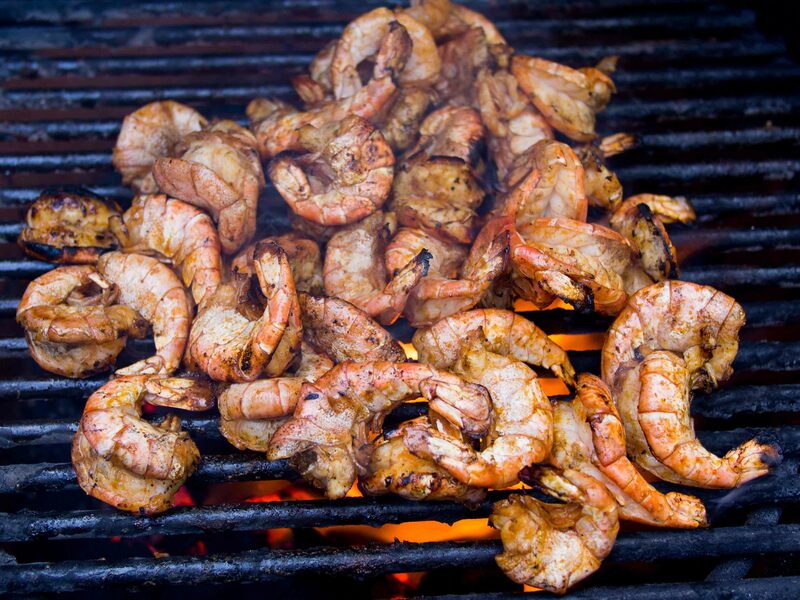 More fun with shrimp on the grill. This time it’s a sweet and spicy version. Combine the hot sauce, sugar, butter, Worcestershire, and garlic powder in a small saucepan. Cook over low heat until the the sugar is dissolved. Remove from heat and let cool slightly (you want it just warm enough to keep the butter melted but not so hot that it cooks the shrimp). Pour the hot sauce into a large bowl and keep it warm and close to the grill. 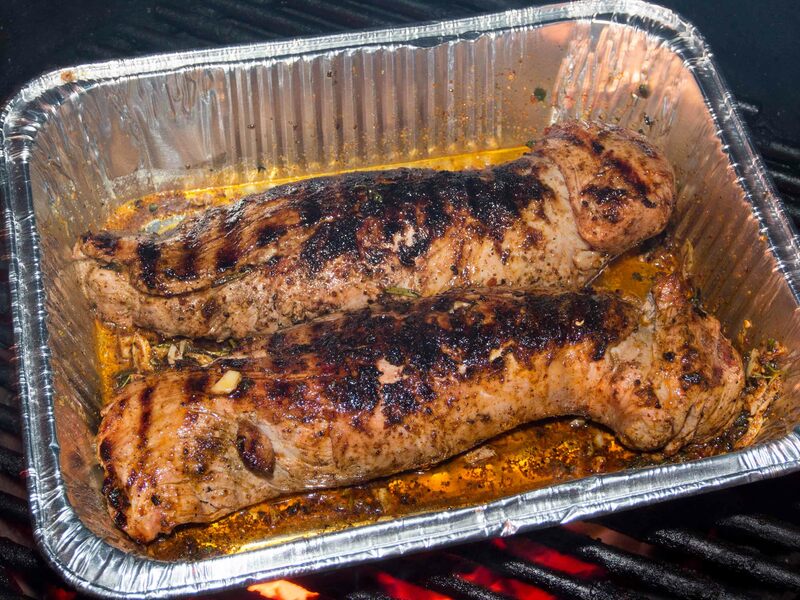 Set your grill up for a direct cook over medium-high (400°F) heat. 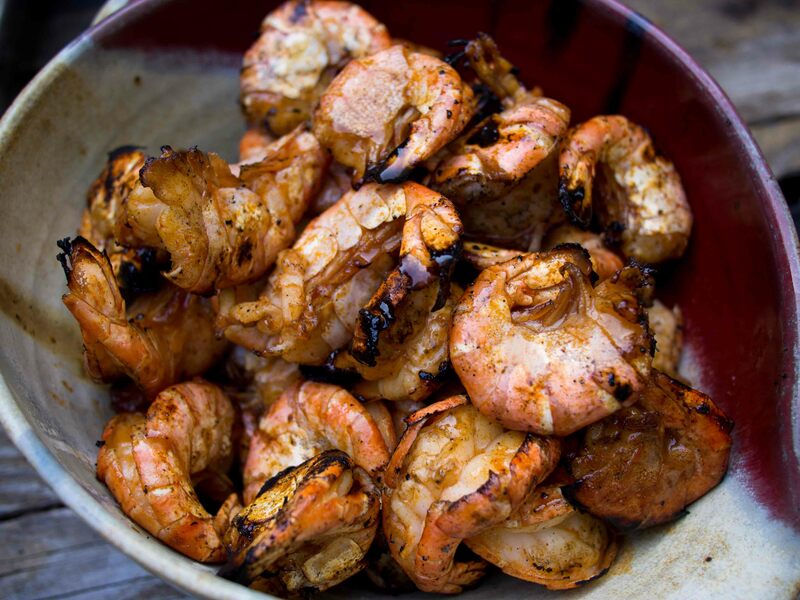 Grill the shrimp 2 minutes on one side. Flip and cook for another 2 minutes. Flip again and cook until just pink and curled – about another 2 minutes, or 6 minutes total. 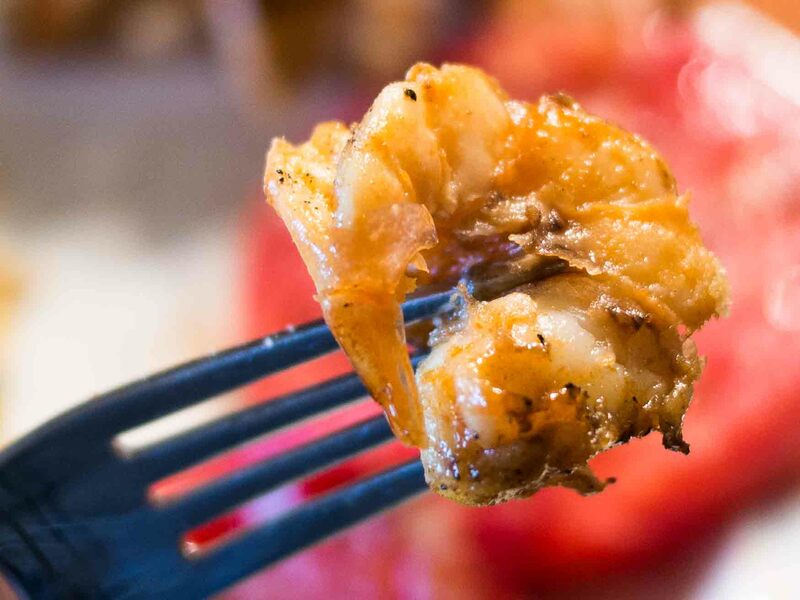 Move the shrimp to the bowl of hot sauce and toss to coat. Move to a serving platter and drizzle with remaining sauce before serving. As much as I love wings, I have to say that I’d take these shrimp over buffalo wings any day. 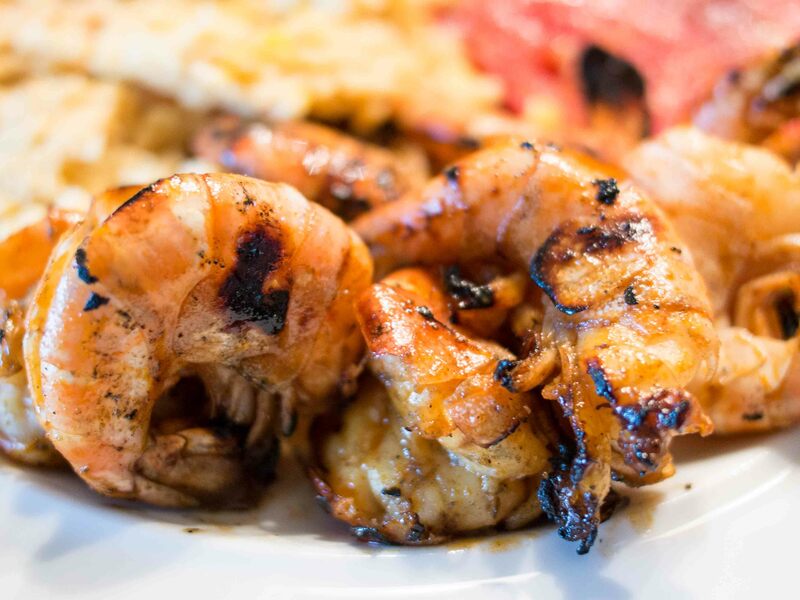 The sweeter sauce works really well on shrimp and plays nicely with the tang and heat from the Franks’. These were perfect as part of a meal but if I were doing these as appetizers I think I’d add some salt and a little more heat. Maybe a touch of Marie Sharp’s just to make things interesting.